Production Expert | The Apple Switch From Intel To Arm Processors - How Will The Pro Audio Industry Prepare? The Apple Switch From Intel To Arm Processors - How Will The Pro Audio Industry Prepare? It's a rumour that won't go away and it has recently resurfaced again, that Apple is planning to switch Mac processors from the Intel CPU to Arm. Reliable sources suggest it could happen as soon as 2020, which is less than a year away, which is why some suggest Apple has been slow to refresh the Mac product family. "Apple will abandon Intel processor chips for its Macs in favour of homegrown Arm-based chips, according to a securities analyst. Formerly at KGI, Ming-Chi Kuo of KeyBanc Capital Markets, has a strong record of reliable Apple predictions. Kuo issued the prediction in a research note, suggesting the switch would be made in 2020 or 2021, adding to similar claims earlier this year that prompted a nine per cent fall in Intel’s share price." "If the Mac is about to undergo a transition to Apple-designed ARM processors, it might make sense for Apple to keep the MacBook Pro where it is, a known quantity designed to received the latest Intel processor generations, while it makes changes in other areas." "The next Mac you buy may not have Intel inside. Apple is pushing forward with plans to ditch Intel’s processors in favor of its own chips, according to a new report that claims the transition away from Intel CPUs will likely take multiple steps." So why are we talking about Apple switching to their own Arm processors in 2019? In professional planning terms, a year is not a long time, to put that in context the first Avid HDX systems were announced over 8 years ago. Universal Audio Apollo interfaces were first introduced in 2012, so you get the sense of how time flies when you are having fun. "PowerPC-only code ran for a while on Apple's emulation layer called Rosetta. Once again, applications shipped with binaries containing code for both Intel and PowerPC, but this time around, they were called for a brief period of time in the beginning of the shift "Fat binaries" before settling on "universal binaries" for the remainder of the transition. The first nail in the PowerPC coffin was the release of Snow Leopard. The final was the extermination of Rosetta in MacOS Lion, released on July 20, 2011." 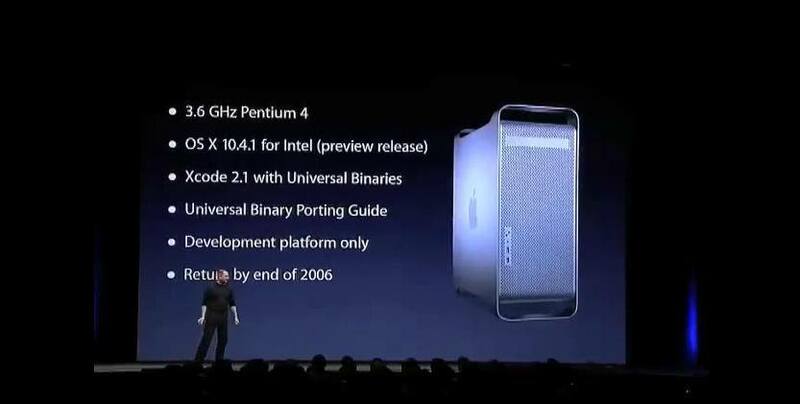 Apple also created what Jobs described as 'The Apple Developer Transition Kit', which was an Apple that Job's revealed the Mac he had been using for his WWDC demo was actually running a 3.6 GHz Intel Pentium 4 processor and not a PowerPC chip. To all intents and purposes, it looked like a PowerPC but it was a developer computer that could be hired for $999 from Apple, Jobs made it clear this product was not for sale. "While a "development only" ARM Mac would surely be beneficial to many, would Apple instead rewire the iOS Simulator in Xcode to accept modern Mac apps? Could it create some sort of sandbox to run these programs on an iPad Pro? The possibilities are numerous, but as a hardware guy, I hope 2019 or 2020 is a repeat of 2005, and we see another "this is not a product" moment from Apple." Hardware is only one part of the complex problem of transition to a new CPU, software is also a big part of the equation, and those of us with an investment in DAWs and plug-ins are acutely aware of. Some will recall how Spectrasonics was left with a huge issue that took some time to resolve to get native Universal Binary support, they were just one of many vendors who were impacted by the last Apple chip change. "Navigating this terrain will prove easier than the hardware front. Apple’s XNU Kernel for macOS is compatible with x86 and ARM64, removing the need to re-write code completely. Speaking in broad terms, this eliminates the need for large-scale tinkering with macOS’ base i.e. the kernel. Finally, Cupertino’s requirement for app submission in the form of LLVM Bytecodes further eases out the path for a future transition. This removes the need for recompilation and allows new code to be generated simply to target the architecture in question." Will The New Mac Pro Use An Arm Processor? One thought is that the new Mac Pro is being delayed to take advantage of the move to the Apple Arm CPU, however, it's likely that Apple will start with the MacBook Pro and then perhaps move onto the Mac Mini, so don't hold out hope that that the new Mac Pro is the moment Apple unveil their new chip. At this point, stay informed so that if you need to make purchasing decisions you don't buy a Mac and regret it months later because Apple has started its transition to the Arm processor.